Porcelain veneers have long been one of the most popular cosmetic dentistry treatments available, able to completely transform a smile all on their own. If you’re thinking about enhancing the appearance of your smile in any way, they can provide a fantastic solution. 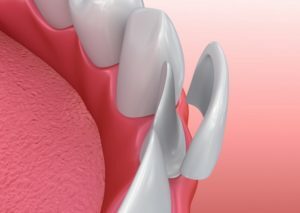 Of course, you’d probably like to know a little more about them before going to see your dentist, so today, we’re going to talk about what veneers are and how they can help your smile. A porcelain veneer, which is sometimes called a dental veneer, is an extremely thin ceramic shell that is bonded to the front of a tooth in order to improve its appearance. They can be made from a variety of materials, but porcelain tends to be the most preferred because it can better resemble the strength and overall look of natural enamel. Veneers are typically used as a cosmetic treatment for people wanting to get that nice, wide, perfect smile. They can also be used to correct a number of tooth irregularities that could interfere with their function. What is it Like to Get a Veneer? The procedure to get veneers usually requires at least two to three visits to your cosmetic dentist in Weatherford. At the first, you’ll simply have a consultation where your dentist will determine if veneers are the best way to give you the smile that you want. If they are, then you’ll come back to have your teeth prepared to fit the veneers (which involves removing a tiny part of the enamel), and an impression will be taken. This will be sent to a dental lab to fabricate your veneers, and you’ll be fitted with a temporary set for the time being. Once they have been made, you’ll return for a final visit to have your permanent veneers bonded to your teeth. After that, you’re done! Veneers are able to achieve truly amazing results and can completely makeover a smile in just a few appointments. If you have chipped, stained, or gapped teeth (or all of the above), they can quickly and effectively fix them and give you a smile that always fills you with confidence. If you’re interested in getting them, simply visit a cosmetic dentist in your area today. Dr. Garrett Mulkey is a general, restorative, and cosmetic dentist based in Weatherford, TX. Over the course of his career, he has literally placed thousands of veneers to dramatically improve people’s smiles, and he is currently accepting new patients. He can be contacted through his website. by: Dr. Deborah Romack at November 3, 2017 . Comments Off on What Are Porcelain Veneers?